Eric Hodgins’s Classic Comic Novel ‘Mr. Blandings Builds His Dream House’ — You Think Your Problems With Contractors Are Bad? Mr. Blandings Builds His Dream House. By Eric Hodgins. Illustrated by William Steig. Simon & Schuster, 228 pp., pp., $12, paperback. Reading yesterday’s bestsellers can be a little like trying on that pair of white vinyl go-go boots in the attic: You don’t know whether to laugh or cringe at our former tastes. Mr. Blandings Builds His Dream House is a sparkling exception to the rule that bestsellers tend to become dated within a generation and comic novels age faster than serious ones because so much humor depends on topical references. This classic first appeared in 1946 and has never lost the droll charm that made it in an international hit. Mr. Blandings Builds His Dream House satirizes the modern lust for property, and its enduring appeal lies partly in the all-too-believable naiveté of Jim Blandings, a Manhattan advertising executive, and his wife, Muriel, who decide on a whim to buy and restore a 170-year-old farmhouse in Connecticut. They fall in love with the barns, apple orchard and majestic views: “But the furnishings were in general of the era of Benjamin Harrison, with an overlay of William McKinley, and here and there a final, crowning touch of Calvin Coolidge.” And when house turns out to be too decrepit to restore, Jim and Muriel resolve to tear it down and build another on the site. This decision sets up a superbly constructed plot in which the new house becomes the couple’s antagonist. The Blandings square off against bankers, lawyers, architects, contractors, hostile neighbors and the local historical society – in short, all the people who still bedevil home-buyers. But the house itself is their real opponent. Amid the soaring bills and construction delays, Mr. Blandings imagines how delightful it would be “to return to the city and move a final, ten blocks father north.” Will he throw in the drill bit and go back to the Upper East Die? Or sell the place and buy one against which he isn’t so overmatched? Eric Hodgins controls the suspense deftly. And the late New Yorker cartoonist William Steig adds three dozen or so brilliant drawings, many of them a full page, that throw the comedy into higher relief and show how much we have lost now that the fully illustrated adult novel has almost disappeared. Along with Hodgins’s masterly text, Steig’s fanciful pictures remind us that if a man’s home is his castle, sometimes he’s the court jester instead of the king. Recommended if … you like comedy that stays close to life. Hodgins’s satire is much more realistic than that of the over-the-top novels of Christopher Buckley (whose Boomsday involves plan to save Social Security and other benefits by giving baby boomers a financial incentive to commit suicide, known as “Voluntary Transitioning”). 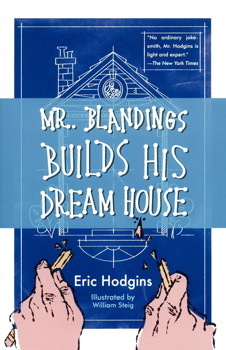 Mr. Blandings Builds His Dream House is also a nearly perfect book club book partly because: 1) It’s a classic that few people have read; 2) It’s relatively short and widely available in paperback and at libraries; 3) It deals with a situation almost anybody can appreciate; 4) It may show a new side of William Steig to members familiar only with his children’s books, such as Dr. De Soto and Shrek! ; and 5) All those slackers who never finish the book can watch one of the movie versions. Reading group guide: This site has also posted a review of the sequel to this novel, Blandings’ Way, and a reading group guide to Mr. Blandings Builds His Dream House, which you can find by using the search box. Published: 1946 (first edition), 2004 (Simon & Schuster paperback). Furthermore: Hodgins’s novel has inspired two movies I haven’t seen – Mr. Blandings Builds His Dream House, with Cary Grant and Myrna Low, and The Money Pit, with Tom Hanks. This is a repost of a review that first appeared in 2007. I am on a brief semi-vacation. Tags: Americans, Architecture, Bathrooms, Britney Spears, California, Decorating, Homes, Houses, Interior Design, Life in the USA, Massachusetts Authors, New York Post, Property, Psychology, Real Estate, Timesharing, Toilets, U.S.
House Lust: America’s Obsession With Our Homes. By Daniel McGinn. Doubleday, 272 pp., $24.95. In California a licensed marriage and family therapist specializes in treating “renovation anxiety and distress,” the trauma of giving a house a face-lift. On the evidence of the lively House Lust, it will take more than counseling – or the Great Recession – to cure Americans of their tendency to covet better homes. Why do so many people lust after mud rooms, brushed-nickel toilet-paper holders, or countertops made from Giallo Ornamental Granite, imported from Brazil? The forebears of today’s house-hunters may have wanted simply to keep up with the Joneses and their carport or Danish modern sofa. 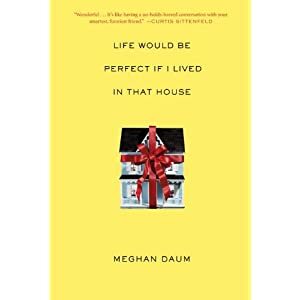 Worst line: “When historians look back on the first years of 21st century American life, the housing boom will be a secondary story, a distant background note to 9/11 and the War on Terror.” Or so it appeared in the pre-crash summer of 2007, when McGinn finished writing House Lust. Recommendation? The provocative questions and engaging writing style of House Lust might appeal to many book clubs, but the reading group guide on the author’s site is one of the worst I’ve seen. Only three out of its 21 questions mention House Lust. And most are pointless: They in no way enrich your understanding of the book and might have occurred to you whether or not you’d read it. Sample: “If you had a chance to pitch a new show idea to HGTV, what would it be?” How does this help you understand the book? What’s odd is that irrelevant questions like these are usually intended to distract you from the poor quality of a book, but House Lust is good, so they’re self-defeating. Caveat lector: This review was based on an advance reader’s copy. Some material in the finished book may differ. About the author: McGinn is a national correspondent for Newsweek who lives near Boston. Tags: Books, Homes, Houses, Life, McMansions, Money, Property, Quotations, Real Estate, U.S. Some new homes are so big that “visitors might require MapQuest to navigate their way from room to room,” Daniel McGinn writes in House Lust: America’s Obsession With Our Homes (Doubleday/Currency, 2008), his pre-crash exploration of the fixation on shelter among the well-heeled and those who would like to be.